It is important that your system is installed correctly and efficiently both to ensure your safety and to have the system ‘signed-off’ by a professional HETAS engineer or a specialist from the local council, ensuring compliance with the legal requirements set out in document J of the Building Regulations. While some of our customers adept to DIY choose to undertake the work personally we are now pleased to offer a full installation service in the Mid-Essex area. A specialist engineer can visit your property and conduct a full survey and provide a quote. 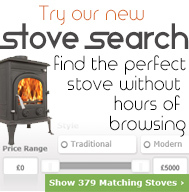 We only charge a modest £25.00 for the service which is fully refundable should you go ahead with the purchase of the stove and installation. For more information on installers in your area or anything else to do with this service, please email your enquiry to: enquiries@glowing-embers.co.uk. Wood burning stove installations fall under legal Building Regulations and all installations must meet these requirements. All installations must be signed off either by your local council or by a HETAS registered engineer. This current edition of Approved Document J (Combustion appliances and fuel storage systems), has been updated and replaces the previous 2010 edition. To download the full guide click here. 1) Start your insulated system with a length of single wall vitreous enamelled pipe. 2) Convert to twin wall flue pipe using a Converter from Single Wall Adaptor. 3) To build your insulated flue pipe system, you have to plan your route and measure out what components, pipe lengths and bends you will need. 4) To go through a wall, you will need a wall sleeve to protect the wall and a finishing plate to cover the hole, which must be larger than the outer diameter of the pipe. 5) If you decide to continue internally, then you can pass through a ceiling using a firestop plate. 6) Pass your insulated pipe through the roof again be sure that no part of the roof touches the pipe. 7) Finish off with a chimney cowl or rain cap. If you do not have an existing chimney in your home and you want to install a wood burning stove, or if you want to install a free standing modern wood burning stove, you will need to use Twin Wall, Insulated Flue Pipe. We have a complete range of Double Wall Flue pipe from Shield Master, Convessa and Dinak DW along with three brands of accompanying single wall enamelled stove pipe. Because no two installations of twin wall flue pipe are exactly the same we cannot supply kits, as we can with the flexible flue liner kits. You have to decide where you want the flue to run through the house. You need to either go through a wall and then out and all the way up an external wall to above your roof or you need to go up internally, through your floors and through the roof itself. The path the flue will take to do this will depend upon the configuration of your home and how you want to route the flue pipe. Accordingly you will have to plan and measure out your twin wall flue system. If you do not feel comfortable doing this then you can get in touch with a local builder or HETAS installer, who will be able to help you. Either way you should make yourself familiar with the building regulations as wood burning stoves do fall under these regulations – more information can be found here. This page is designed to help you understand how to put your system together and take some of the mystery out of planning an installation – however, it is not a complete guide. If you would prefer, telephone us to discuss your installation with one of our team before committing yourself to anything. You should start your system with a length of single wall vitreous enamelled pipe as this is both cheaper and harder wearing, so is more suitable for use with the high temperatures experienced directly from the stove. However for asthetic purposes etc, you can begin your run by using the adaptor to twin wall and cementing this directly into your stoves’ flue collar. If you start your run with single wall pipe you can run internally with this but you cannot pass through walls, ceilings or roofs with it and it can only be used internally. If you have a larger internal wall to scale before going through any obstacles then by all mean use the Enameled Stove Pipe all the way up internally, as this is more economical. You must just convert to twin wall pipe at least 4 inches before passing through a wall, ceiling or roof. Before passing through a wall, ceiling or roof, you will need to convert to twin wall flue pipe using a Converter from Single Wall Adaptor, found here. This slides into the top of your single walled pipe and allows twin walled flue pipe to be attached to the other end. This plus all other joins between pipes in a twin wall flue system require a locking band to seal the join, which is included free with our Shield Master and Convessa range of pipe but must be purchased seperately in the Dinak range. Alternatively some of our wall brackets include a locking band, so you can strategically place your wall mounts at the joins of the pipe to save on components. Now you have converted to Twin Walled Flue Pipe you just have to plan your route and measure out what components, pipe lengths and bends you will need. If you decide to go through a wall, you will need a wall sleeve to protect the wall and a finishing plate to cover the hole, which must be larger than the outer diameter of the pipe to avoid it touching the wall. These two components allow your twin wall pipe to safely pass through a wall. Once outside you can just attach a 45 degree elbow and continue directly up the external wall. If you decide to continue internally, then you can pass through a ceiling using a firestop plate, which ensures that you cut back the ceiling far enough away from the pipe and covers and finishes the holes. Please note: you must use a ventillated firestop plate for wood burning stove installations, the plain firestop plates are for gas installations only. You need to use one either side of your floor (i.e. one on the ceiling and one on the floor above). To pass through a roof again be sure that no part of the roof touches the pipe. Use a firestop plate on the underside of the roof to cover the hole and flashing on the top of the roof to seal it. You will need the high temperature flashing if your insulated pipe passes through the roof less then 5 meters away from your stove, otherwise the low temperature flashing should be fine. If you have a corrugated or uneven roof you will need the EPDM masterflash which molds to the shape of your roof. A fixing kit is available for the flashing which gives you everything you need to create a weather proof seal. You will need a storm collar to clamp the top of the flashing tight around the twin wall flue pipe to create a weather proof seal. You need to ensure that your twin wall flue pipe is at least 600mm higher than the pitch of your roof or the top of your flue pipe should be at least 2.3m horizontally away from the roof as it slopes away, whichever comes first. On top of your pipe you will want to finish off with a chimney cowl or rain cap, available here. ABOVE: Lining a chimney using a multi fuel flexible liner for wood burning stoves. For a wood burning stove to work correctly it must be connected to a sound chimney and correctly sized flue, therefore it is always recommended fitting a chimney liner when installing a new multi-fuel stove. If a chimney liner is not installed there are a number of problems that you may experience. 1. Smoke and fumes from wood burning stoves leaking into other rooms or parts of the building. 2. Tar seeping through the chimney walls causing staining. 3. The old flue surface has deteriorated, resulting in poor up-draught. 4. The flue is much too large for the type of appliance being used resulting in poor up-draught. 5. The flue is cold and damp especially if it’s on the outside wall, reducing the heat of the smoke and gases resulting in poor up-draught. If you would like your chimney liner to be installed for you, please see our HETAS installer page. There are no specialist tools needed to fit a flexible chimney liner for wood burning stoves, however you will need access to the top of the chimney stack using roof ladders or preferably scaffolding, it is highly recommended to use harnesses when working at height, other safety equipment should include masks, goggles and gloves. 1. Before you start the chimney must be swept and inspected for structural defects and the area around the stove should be protected from debris and dust. 2. If you are using our chimney pot hanging cowl, you can skip this step, otherwise you will need to remove the chimney pot and mortar on top of the chimney stack. 3. Cut the register plate to size and fix the angle iron in place. 4. You will need a piece of rope 5 meters longer than the liner. Tie a weight to it and lower it down the chimney. 5. Attach the nose cone to the bottom of the liner (the liner is directional, arrows pointing upwards) and if using Rockwool, Chimwrap or k-wrap secure this to the liner. 6. Tie the rope to the nose cone and lower the liner down the chimney, if there are bends in the chimney and the liner gets stuck it is possible to open up the chimney from inside the house to help the liner navigate the bend. 7. 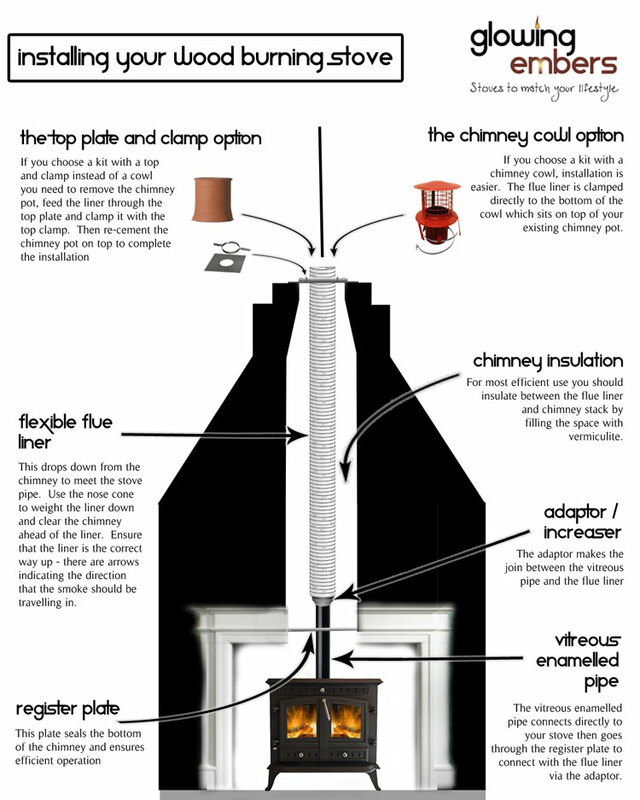 Once the chimney liner is in place, connect the chimney liner to the appropriate adaptor using stainless steel self-tapping screws then fit the stove pipe, now fit the register plate, put the stove in place and seal around the register plate and flue pipe with fire cement. 8. If you have pre insulated the flexible flue liner it is recommended that you put adequate vermiculite insulation above the register plate to stop the heat escaping in to the chimney void, this should be done before putting the top plate on. 9. If you haven’t pre insulated the flexible flue liner then it is recommended you fill the chimney void with vermiculite insulation. 10. If you are using a chimney pot hanging cowl cut the flexible flue liner to length and attach the chimney pot hanging cowl to the chimney liner using the provided fixing straps, insert the cowl into the chimney pot and attach using the straps provided. 11. If you are using the traditional method cut the liner to length and fit the top plate and insert and then the top clamp. 12. Re-fit the chimney pot and leave for 34 hours before performing a smoke test. Wood burning stoves should always be treated with care, regularly maintained and well installed. A poorly installed or poorly cared for wood burning stove can cost lives. These instructions are designed as a guide only to help safe installation but if you are unsure on how to install your wood burning stove then please do contact a professional.